I'm curious what this game looks like. Since I missed the twitch streams I haven't seen any screenshots. Or is it supposed to be a surprise? Graphically, for the most part, I went for the song "Simple and Clean" (shout out to any Kingdom Hearts fans there ). 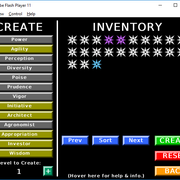 Here's a screenshot of the game itself. The particle effect are the enemies dying. Don't look to me but rather to the One who is the reason for what I do. If you need help, send me a PM. Even if I haven't been on in the forums in ages, I still receive those messages via email notifications. You can also reply to any of my forum posts, regardless of the age (especially if I created it), and I will likely reply. As you can likely see in the menu screenshots, I followed a similar system for each. 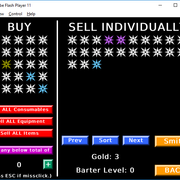 While most of it was laziness on my end (that's almost all done with images, so it takes longer to make), I also needed that inventory to show up in each spot, so it just kinda made sense (one to use them, one to sell them, one to convert into materials). Also, the color-coding in the inventory is to show what the items are (white is equipment, blue is EXP bonus, purple is temp boost, gold is crafting materials, orange is instant level up). Just did some more testing for fun... looting was still too OP. I am trying a new nerf now where the loot ability only increases the quality, not the quantity of loot. That should hopefully balance things out (previously, while you got a lot of crap loot even with a high level of loot, you could get so many items that there was almost guaranteed to be some good loot). Loot is better now. 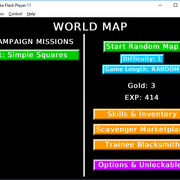 I've been working on the unlockables today. There are three types in total: tower faces, enemy faces, and mouse cursors. 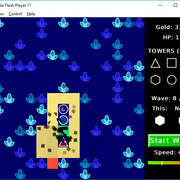 While the faces are actually the same (although will unlock at different random times) for the towers and the enemies, the mouse cursors are causing my non-artistic abilities some troubles. I also had to come up with a system to allow for animated images (which is not natively supported in the strict terms: the animation/frame you first use is the one the image stays as). I am also allowing for the cursor color to change (on top of all of the other color manipulations), and if I can do it, I am going to allow for 90-degree cursor rotation so the user can set it how they want. I also have an option to turn it off too if the user prefers the default one. Yeah, I get into the customization options ; it's great what images can allow for. As an aside, does anyone know of a simple code to check to see if the mouse is off the screen entirely? Right now the image for the mouse just stays where it last was. I can't find a thread where I uploaded multiple images, but I'm pretty sure I did somewhere. At least, I think I did. Maybe. There's a "more attachments" link under the "Choose File". Anyway, looks good so far! I got a bit confused with all the colors at first glance--but if I were actually playing the game then I'd only be looking at one screen at a time. I never liked balancing. The math/statistics interests me (I'm a mathematician, so of course ) But when I sit down to play the game it always seems off and requires tedious experimentation to adjust. It's harder to account for player skill, especially if it's your own game and you're play testing it yourself. Options page is coming together. 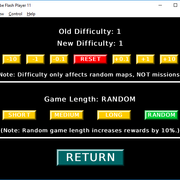 It's a bit slow because of having to put in the options (I had to overhaul my button system a bit), but I have been mostly forward-thinking, so the implementation is mostly going smoothly. The biggest question will be if the users prefer the control over the colors (18 different customizations there!) enough to overlook the mostly cheap-looking graphics system I have used. If the game does well, then I am hoping to further overhaul the graphics to make them better, but for now I am focusing on the color customization instead. I'm hoping to finish tomorrow. I already have a RGB triple-slider for the color creation started up, just like you would find in a graphics program. 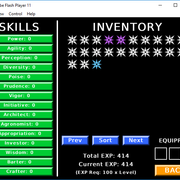 Everything else in the game is finished, including the new fireworks I added in. Played it for a bit today and really enjoyed it. I like all the options and upgrades, although it took me a bit of time to find my way around since there was a lot to look at. Do you have any suggestions for streamlining it? My first thought playing through was that I could've used some kind of tutorial to explain how the different shapes behave. But I went for the random games after playing the first campaign. Once I realized the campaigns introduce you to the different enemy types, I started picking the game up more quickly. So something that steers new players to the campaign mode (not necessarily forcefully) might help them avoid the same mistake I made. The game definitely has a nice framework to it. The turrets do what they should and the random map and random tree code adds a really nice touch of randomness to the game so it doesn't get boring -- so bonus points for replay-ability. The concept itself is fun enough to be its own genre. I can imagine once you get in decent graphics/gui for the game it'll be up to par with the protector series. All in all, nice game so far, just keep working on it.